Merry Christmas! (Or Happy Hanukkah, or whatever). 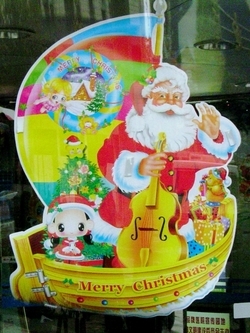 T'aint't no War on Christmas here in East Asia -- that photo on the right is from the window of a hospital in Wuhan, China, which I took last year during my vain attempt to escape the relentless Christmas atmosphere (shoppers, Santas, and singing of Christmas music on PAs (Tannoys, for you Brits) everywhere here in Tokyo. No luck, exactly the same, especially in Beijing. (We did spend Christmas Day 2004 on a day trip to the Buddhist Dazu Stone Carvings outside of Chongqing (formerly Chunking), a World Heritage Site that which was mercifully Santa-free. Now pardon me, I need to go do some last-minute shopping: since Christmas isn't an official holiday in Japan, the stores are still open. The only reason I'm not at the office now is because it's Sunday, but I did get the long weekend because Friday the 23rd was the Emperor's Birthday. No Emperor's Birthday Sales or Emperor's Birthday Songs -- well, maybe the latter is true among the right-wing whackos. Of course, if you want the REAL War on Christmas, you'll have to see Operation Kringle Kill for that. I'm back in Tokyo, and at my own computer, so it's time to post some photos of my trip. You can find the first batch of photos (of Beijing's Forbidden City) at http://calton.fotopages.com/?entry=313183. It's 7:30 pm, and I'm at the Salisbury Road YMCA in Hong Kong, where I checked in this afternoon. THIS IS A YMCA?!!? My god, it's probably the most luxurious place I've stayed in during my entire trip. 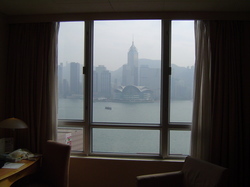 I'm checked into 15th floor room facing Victoria Harbour -- yes, I paid extra for the harbour view, just because -- and I'm heading out at oh-dark-thirty tomorrow morning to catch my 0850 NW flight outta here. I'm about to dash out to catch a ferry cross-harbour and maybe get a glimpse of Hong Kong Island before I turn in for the night. UPDATE: This was the view out of my window when I checked in that afternoon. Checking in from Guilin, about which I'll have plenty more to report when I collect my notes. But I'm leaving China in just a few days. I went to the Guilin train station this morning and tried to buy a ticket on the K38, which my train guide had as the only train to Guangzhou. No dice. Instead, the woman at the window sold me a soft-berth ticket on the L108, which leaves tomorrow night at 8 and gets in the next day at 8:50. The problem is, I can't find any such train in my rail guide -- or even any that starts with "L". A Google search turns up one English-language mention, in a tour company's itinerary for a guided tour of the region -- the only reason I don't pull the plug on this and see about getting a flight direct to Hong Kong. Wish me luck, because I HAVE to be in Hong Kong by oh-dark-thirty Thursday at the latest to make my morning flight. But best case, I'll have only half-a-day in Hong Kong anyways. Another photo to tide you over: early morning on the Yangtze, entering the last of the Three Gorges. I'm checked into another luxury hotel, this time in Changsha, a Singapore-managed place called the Royal Seal Hotel. I realize that this is the off-season, but man, it's Amateur Night In Dixie when it comes to service around here. Okay, I'm acting spoiled, but I have a full-blown cold, and I'm not in a very forgiving mood right now. My body aches, I have cold shivers in the night, and my head is killing me. Tomorrow, we push on for Guilin, but today, I will spend in bed. And, to tide you over for awhile, is a photo from the Dazu Stone Carvings (Tang Dynasty) near Chongqing (aka Chunking). Liz and I just got back from three days down the Yangtze -- it's mostly flooded (140 meters, about 3/4ths of the top level, or so I understand) so some of the most distinctive features are gone, especially in the Little Three Gorges (no rapids to speak of -- spectacular cliffs, though). The big problem we had was that the cabins (separate 2-bed cabins for each of us, at a very slight discount) we booked on a Chinese tourist (not foreign tourist) boat -- despite being promised otherwise -- had NO heat. I'm pretty sure it hit zero degrees C or close to it, and the damp winds blowing through drafty cabins didn't help. The last eight hours were fairly hellish, in that we ended the trip with a night-time tour of the Three Gorges Dam -- hell, we'd paid for it, and we thought it meant a ride on a warm bus. Which it did, as well as an aquarium, a historic horse pageant, and some random little temple, all to keep us occupied while the boat was going through the locks. It was midnight by the time we finished at the temple by the ferry dock, and the nice warm tour buses had gone away, leaving us to wait among the food vendor tents stir-frying dinner for the tourists. The tour guide the boat company assigned to us (whose English was barely functional -- as I got more and more frustrated with our general situation, I tortured him by pretending not to understand anything he said) told us we had to wait an hour in the cold -- it turned out to be 2-and-a-half. That, and the unheated 4-hour bus ride from Yichang (where we docked) to Wuhan made us long for luxury. So we checked into the Holiday Inn Tian An Wuhan City Centre, to be certain we had HOT water and LOTS of room central heating. God, I feel so decadent. More later, but they're closing the hotel Business Centre for the night. Ah, the wonders of modern technology. I'm at the Chung King Hotel in Chongqing, and I tried using the slow and cranky Internet connection in their Business Centre, to no avail. Instead, I'm using a borrowed iBook (thanks Liz!) and stealing the WiFi in the hotel lobby, for a much faster, more pleasant, and ENTIRELY FREE experience. Arrived in Chongqing tonight after a 25-hour, 2087-kilometer train ride from Beijing. As I was, near as I can tell, the only foreigner in the off-season on a train not really set up to deal with foreign tourists, it was an quite an experience. More later.